We choose Iceland because bear nature, lonelyness. One can find glaciers, black beaches, rivers, geysers, sulvators and vulcanos. 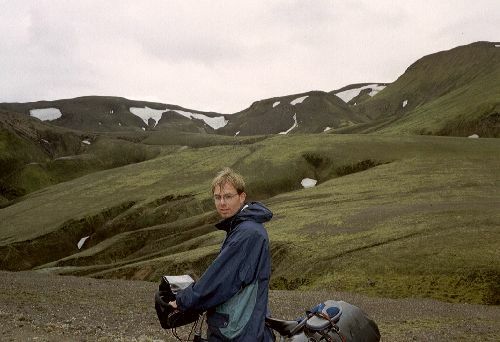 Iceland is a great country for camping and exlporing by bike. The funnest part is wild camping. Place your tent near a river and relax. In the inlands you have to be prepared! You have to plan where you buy food, because shops are not on the route, so take food for several day with you. We took food for 6 day with us. That is really great, to be totally independend. On Iceland water is everywhere, and it save to drink but to be sure we purified it. During these 3 weeks we have eaten mostly pasta, salami, Mars, Fresca (7-up), cans with Del Monte fruit and skir (fat yogurt). 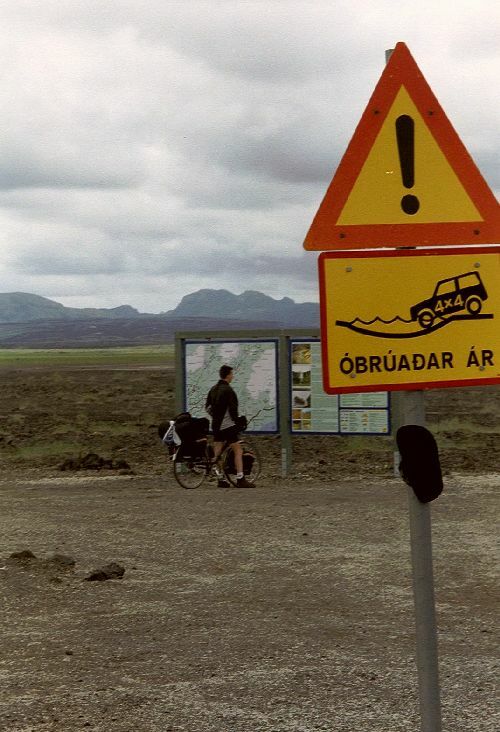 Biking in Iceland means having a great time. Where normal cars have to stop we continued. Only 4-wheel drive cars with high clearance can enter the inlands. In the inland roads are meanly gravel, and bridges to cross rivers often do not exist. On one day we crossed 20 rivers in 40 km. The water depth varier between 10 cm to half a meter. On hot days rivers can change very fast, in the mornig the are small and during the day they become wider and more dangerous. It is very handy to have special shoes for crossing rivers. With bare feet it is no fun because of the sharp stones. The weather in Iceland is always good. You can expect rain, heavy wind and sun. So don't forget you suncream as we did. 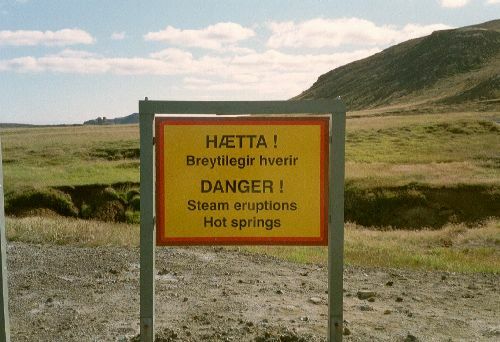 During your ride across Iceland you will notice the forces of nature. Iceland is situated on the junction of the American plate and the European plate. In Pingvelir the two plates come together this can be clearly see above the surface. 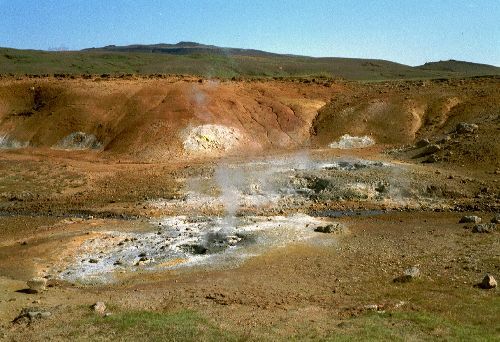 Geothermal activity can be see all over the country, vulcano's, geysers, boiling mud-pools, hot streams. The most famous Volcanoes are Hekla and the vulcano under the Vatnajokull glacier. Vatnajokull is the biggest glacier of Europe, it length is 120 Km. In 1996 the vulcano below exploded, it melted 500 meter of ice in three days and released 3 cubic km of water. This big stream of water destroyed a part of the number 1 highway. I is quite impressive to cycle over this part of the number one. 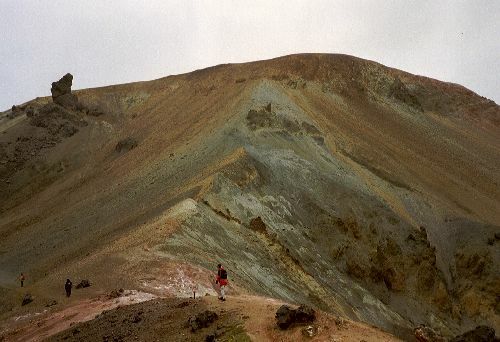 Further we love Landmannalaugar and its surroundings, fantastic! Actually there is nothing but nature. The campsite there has hot showers and toilets and in a old bus you can buy a cup of coffee. In the mountains near the campsite you can walk in the snow, and take notice of the most beautiful colors in the world. At the end of the day a hotpot is waiting for you. To rivers come together, one stream of 80 deg Celsius and a cool stream. On the point where they mix a relaxing water temperature occur. Many people come here to sit, relax and meet other people. Over there we met a woman from Amsterdam. Here front chain-wheel was bend and she was unable to bike any more. With a pulley we removed the chain-wheel and with a original Iceland stone we hit the chain wheel till it was straight again. In this way she could continue her trip.